Azienda Agricola Bellavista is not part of our programme at the moment. But don't worry there are plenty of other options to look at. 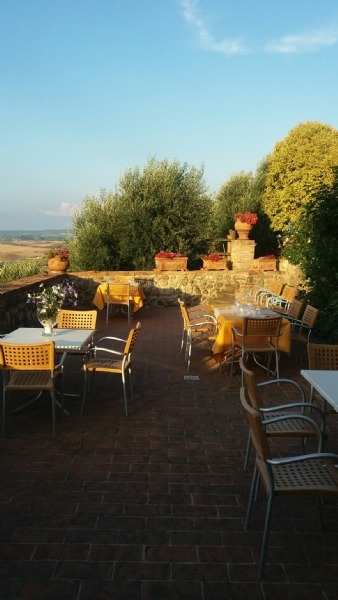 Read personal reviews of Azienda Agricola Bellavista in in Chianti wine district. 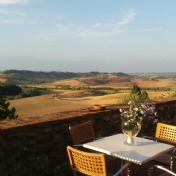 The reviews of the agriturismo are written by guests who have travelled with In-Italia. All reviews are of course uncensored in order for you to get an honest description and review of Azienda Agricola Bellavista. 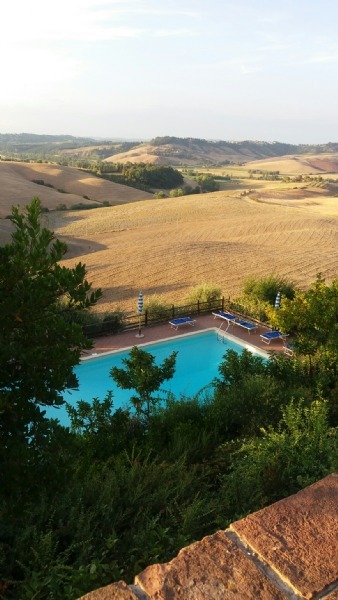 In addition to the review of the agriturismo you can even get good tips from our guests on subjects such as day trips, restaurants, sights, beaches, local transportation and much more. We were very satisfied with our accommodation. Great room, fantastic view and very nice service. Lovely place. but a little too cold and solitary, when the temperature isn't above 20 degrees. The apartment and the view are beautiful, it's Bella Vista, - we really enjoyed the Margarita apartment, but it was too cold, when the temperatures got below 20 degrees. It was cold at night and it was cold in the evening in the apartment and when you've only got a sheet and a thin blanket, as covers, a wool blanket doesn't help that much. It was also really difficult to get hot water. We were cold and that took away some of the joy of the beautiful apartment and the surroundings. Stefania, who's the hostess, was incredibly sweet, but they were very busy with the harvest and because of that there weren't wine- and oil tasting. I think it is a small paradise, when the sun is shining, because the pool area and the small gardens/terraces, are lovely and the view is incredible. 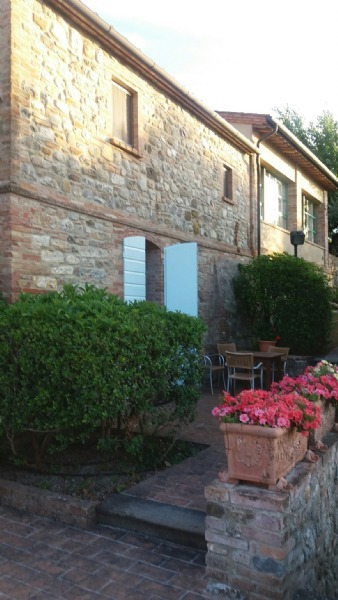 Central location for trips in Tuscany, but the town Lajatico itself is not particularly exciting and it requires that you can walk well, if you are not to drive from the farm to the town. We were two families away together and everything went really well. Kind owners, who had everything under control, and always were ready to help. 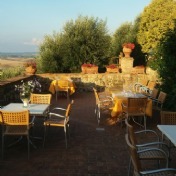 Lovely place and great restaurant. Beautiful nature and view - and lovely with a small private garden for example for breakfast and a nice pool with lots of space. The apartments was nice and cool in the hot climate. All in all a great place which we would like to return to. 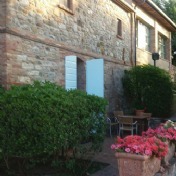 I booked the Girasole cottage at Bellavista for 4 friends attending the Andrea Bocelly concert for 3 nights. I wish I had booked a week long break here. We only saw the owners on arrival , departure and dinner on the first evening. The cottage has everything you need- except AC, but a fan was supplied for the warmer bedroom upstairs. We felt we had our own private pool as there was rarely anyione else around. 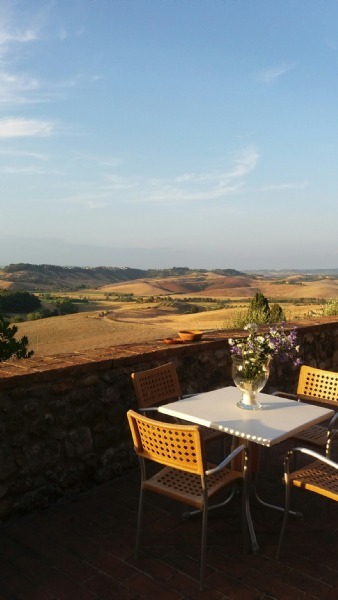 Views are breathtaking and endless over the Tuscan countryside. The village of Lajatico was a 5 minwalk uphill and had everything we needed. In -Italia were very quick to respond to all queries pre arrival. 2 of our group arrived via trains from Verona and the nearest station is Pontedera- approx. 30Km away. We found a taxi straight away and the cost was 50 euros to Bellavista. There was a large supermarket en route where we bought provisions, but the local shops on the square in Lajatico supply wonderful local and home made produce . Opening times as expected -7am and closed around midday for the afternoon re-opening around 5pm. There are a couple of bars in the same place and a restaurant. no AC- temps around 35+ when we were thwere , but manageable with hilltop breeze. 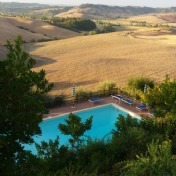 Peace and quiet, relaxation, Tuscany nature and food.